It’s been long time since I last wrote something. 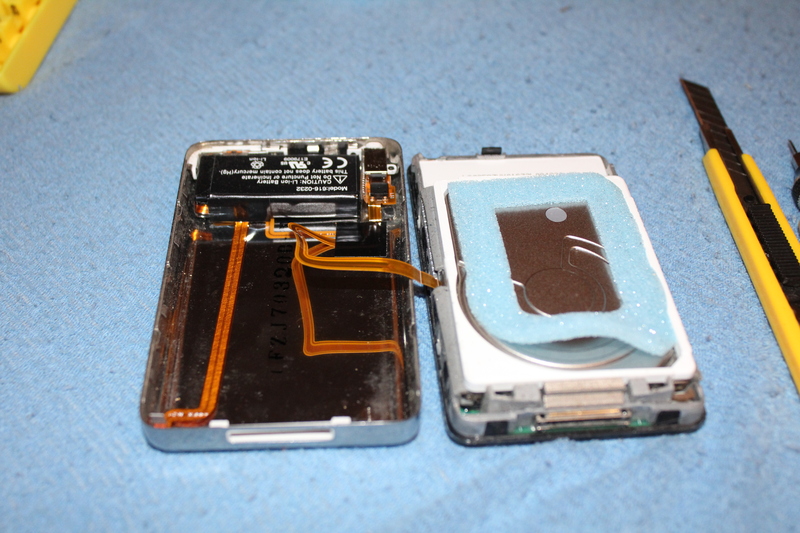 I got couple weeks ago or so an iPod 5.5G a.k.a iPod Video a.k.a iPod 5th Gen Late 2006 from someone I know from Helsinki Hacklab. 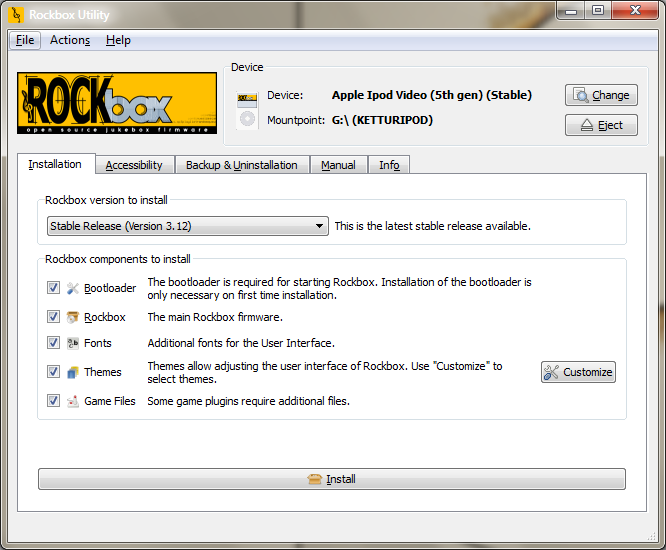 It is 80GB model, and came with Rockbox already installed. I updated the rockbox and made theme for it. So, when I got dock cable for iPod(old owner did not found usb cable but luckily another guy I know had unwanted cable so I got it) I updated newest Rockbox version. It was easy, just plugged player to computer, started program called the Rockbox utility, selected my iPod drive and clicked “Install” button. Nice, now I have one of the “best” mp3 players, and one of the best mp3 player operating systems. One thing that did not pleased me were themes included with rockbox, so I created/edited my own. I based while playing screen to theme called RockFlow, which was nice, but messy and ugly static background which tried to mimic cover flow or something turned me away. But why not edit it to respond my taste? Old and new version. I erased background, and draw new play,pause, and rew/ff icons. HDD activity icon is also my own design. Changed also progress bar color to more appealing. Credits from original wps goes to original creator. My edited theme can be downloaded: Ketturi_theme.zip. I also tinkered with main menu theme. Used fonts and icons from rockbox’s extras and background from my picture folder, I don’t know author so sorry not mentioning it. Rockbox have all kind of neat features. There is much more configurable settings than original firmware. For example sound settings are much better and it sound’s better to my ear. It does not need iTunes or other software, files can be just droped to folders. There is option to use iPod’s keys to control pc while connected to usb cable which I found neat and useful. 80Gb is huge amount of music, more than I would even need. 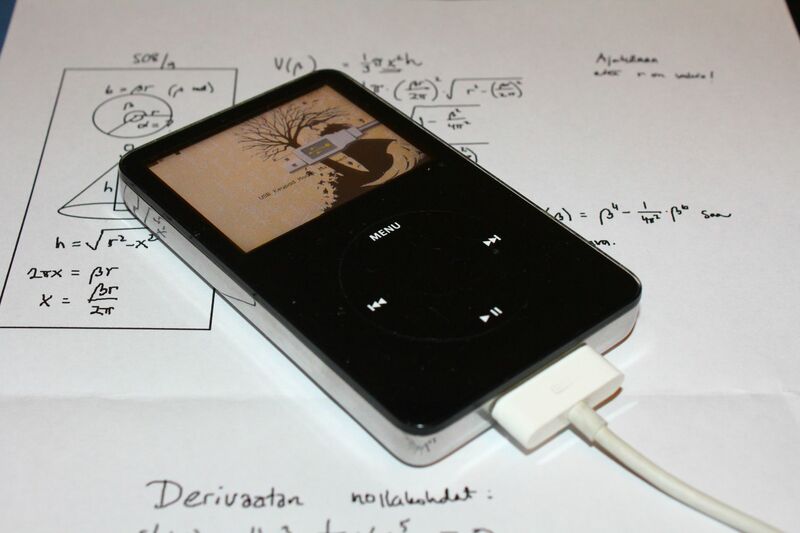 And after all it is iPod, a status symbol (even tough I’m not Apple fanboy). PS. And of course I opened it, what else you would think about me! Forgot to took photo from main pcb tho.